Just a quick update as many of you have been asking. The wining bidder as was announced has plans for student flats. Representatives of Peveril Securities did ask to meet with me and I was happy to oblige. 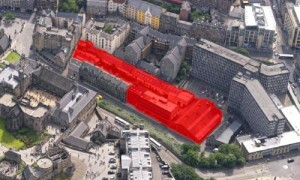 Given all I was told by Edinburgh Council I find their plans perplexing but as things stand they tell me they have no concrete ideas for an arts complex just a commitment to build one after consultation. Retail seems to consist of a cafe within the “arts complex” and the “attraction” that the council made so much of for now seems to be forgotten. The accompanying hotel I’m told could be anything as again they will go to the market for a best offer but everybody I have consulted sees it as being a budget hotel something I know will be unacceptable to many. They have other meetings in the coming weeks and it only seems reasonable to wait for those to have taken place before making any further comment. For those wondering why their bid was accepted ahead of others I can say I have it on very good authority they offered a considerable amount more than any other bidder something that in itself I would have expected Edinburgh Council to find a little odd given how competitive the bidding was. It might be concluded that they could only make such an offer by ignoring some of the less profitable areas required in the bidding process.